Basketball – Saint Matthews plays in the Tidewater Catholic Basketball League (TCBL) and is available for students in grades 3-8. Students in grades 3-4 play at the Midget level; 5-6 at the Junior level; 7-8 at the Senior level. Sign-ups start approximately September 15th and practice starts October 15th. The regular season consists of 14 games played on Saturdays and Sundays (Midgets play on Saturdays only) with an end of season Tournament held over two weekends in February. Coaches, Assistant Coaches, and team parents are always needed. Please click here to view our basketball schedules. 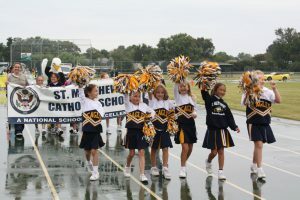 Soccer – Played in the fall and spring, St. Matthew’s has fields teams at the recreational and advanced levels. The sport is open to boys and girls, grades Pre-K 4 through 8th. Registration is early so watch the Friday Flash! Volleyball – Played in the fall. The sport is open to girls, grades 6 through 8th. Cheerleading – To cheer on our basketball teams, we offer cheerleading for two levels, juniors and seniors, grades 1 – 8. Field hockey – Field Hockey is offered in the spring to interested students in grades 2 – 8. Cross Country/Track and Field – At St. Matthew’s, Cross Country running is offered in the fall and Track and Field is offered in the spring. The sports are open to boys and girls in middle school (grades 6-8). Our boys and girls won 2nd and 1st place, respectively, this past spring. Come join the fun! Golf – Offered to interested students in grades 4-8, golf is played in the spring. Football – Available through affiliation with the JJV program at Bishop Sullivan Catholic High School. Open to boys in middle school (grades 7-8). Lacrosse – Available through affiliation with the JJV program at Bishop Sullivan Catholic High School. Open to boys in middle school (grades 6-8). Baseball – Available through affiliation with the JJV program at Bishop Sullivan Catholic High School. Open to boys in middle school (grades 7-8).